We've gotten into the routine of welcoming Shabbat in our Friday posts with a song from the Shabbat liturgy -- usually Shalom Aleichem, Lecha Dodi, or Adon Olam. We find versions sung in locations all around the world, and so far we have posted 24 of Adon Olam, the concluding hymn of most Shabbat services. Today we're sharing a 25th version. 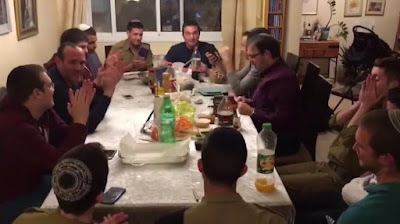 This rendition is by Cantor Shai Abramson and the IDF Rabbinical Choir. Israel is the only country we know of that has a chief cantor in its armed forces. The soldiers look like they are enjoying this Shabbat and the singing that goes with it. Let's join them. Wonderful to listen to these talented young men singing the traditional music ( nusach ) of our past! How wonderful. Please more like this one. Love this uplifting video. Please more like this one.